A little while ago Simon Pickard (aka brickspartan) from Blocks magazine approached me about doing a feature article on me (as part of a series of AFOL feature articles). I was chuffed and flattered for the recognition (and a little intimidated at the same time!) Simon and I had a great time during the interview and I'm really pleased with how well Simon put together this feature. Its available in UK stockists WH Smith, Tesco, Sainsburys, Morrisons, and others(?). I believe its carried by Barnes and Noble in the US and available globally in digital form from the iTunes Newsstand app. 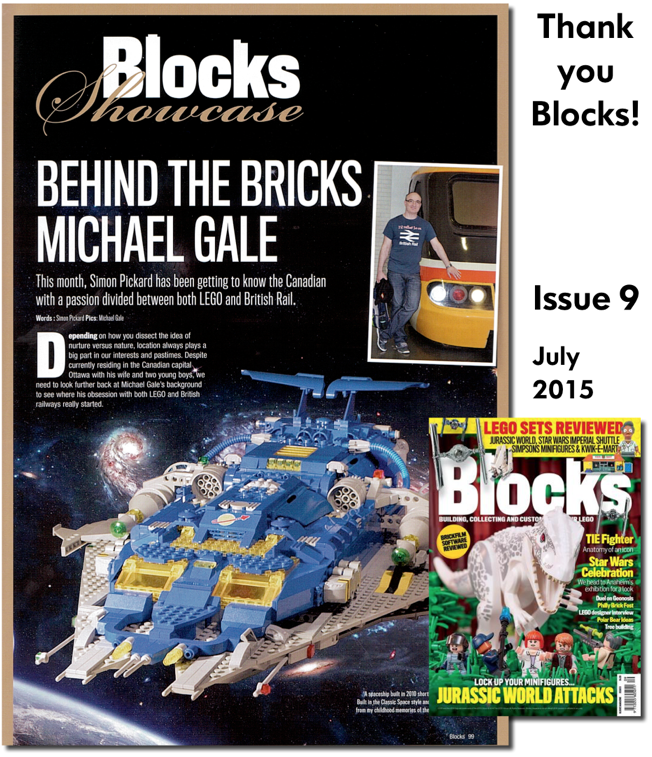 Blocks is a great read with high quality content and production. That should not be come as a surprise since most of the editorial team are mostly AFOLs.